Linear (1D), Postal & 2D Symbologies/Standards all-in-one solution including Code 39, Code 128, GS1-128, GS1 DataBar (RSS-14), EAN 13 & UPC, Data Matrix, QR Code, PDF 417, UPS MaxiCode, Micro QR Code, Chinese Han Xin Code, ALL EAN/UPC Composite Barcodes (CC-A, CC-B & CC-C), USPS Intelligent Mail, MICR E-13-B and many more barcode standards. 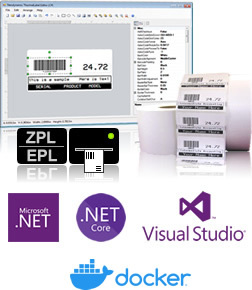 Use your VB.NET & C# skills for printing barcode labels to Zebra ZPL & EPL compatible printers without efforts! First-class barcode label designer component for Windows and for ASP.NET (jQuery + HTML5 Canvas) to empower your end-user with a visual WYSIWYG label editor! GS1, ISO/IEC & AIM-compliance barcodes including Code 39, Code 128, GS1-128, GS1 DataBar (RSS-14), EAN 13 & UPC, Data Matrix, QR Code, PDF 417, UPS MaxiCode, ALL EAN/UPC Composite Barcodes (CC-A, CC-B & CC-C), USPS Intelligent Mail. 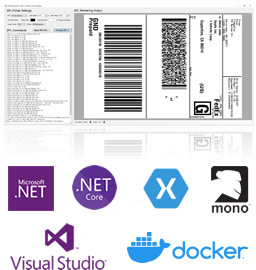 ZPLPrinter Emulator SDK is a .NET Standard Library targeting any .NET Framework, .NET CORE, Legacy ASP.NET MVC & CORE, Xamarin, Mono & Universal Windows Platform (UWP) projects. Use ZPLPrinter Emulator SDK to preview ZPL commands without wasting any single label! ZPLPrinter Emulator SDK renders ZPL commands generating high quality output with high accuracy. ZPLPrinter Emulator SDK works as a Virtual ZPL Printer device! ZPLPrinter Emulator SDK can parse ZPL commands from a .NET string, .NET Stream or physical file. ZPLPrinter Emulator SDK can render ZPL commands for international text as well as most of the barcode types shipped with real Zebra printer devices. ZPLPrinter Emulator SDK can be configured to simulate colored labels for Ribbon & Background as well as provide custom label output rotation! Send raw data, text and native commands to client printers without showing or displaying any print dialog box! Printing common file formats like PDF, TXT, DOC, XLS, JPG, PNG, & Multipage-TIFF are also supported! 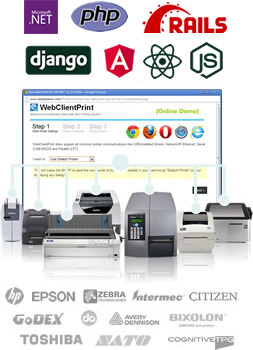 Both WebClientPrint & JSPrintManager support any kind of type and brand printers! Thermal Label Barcode printers, POS receipt printers, RFID printers, Dot-Matrix impact printers, Kiosk printers, ID Card printers, Laser, Inkjet and more! You should take a look at it! Try WebClientPrint for ASP.NET (WebForms & MVC), WebClientPrint for ASP.NET Core, WebClientPrint for PHP & JSPrintManager online! Create composite images supporting image/photo files, Texts like captions and watermarks as well as AutoShapes lines and arrows, rectangles, ovals, polygons, stars, and more! Apply lots of useful built-in Imaging Effects like drop shadows, reflections, perspective views, Polaroid, filmstrip, scaling, resizing, skewing, and more! 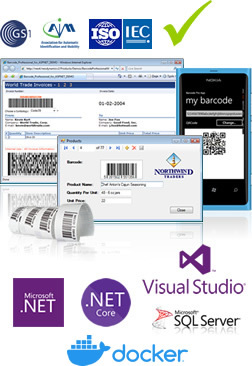 We design and develop Barcode, Imaging, Labeling & Printing Tools for .NET, PHP & HTML/JS developers. 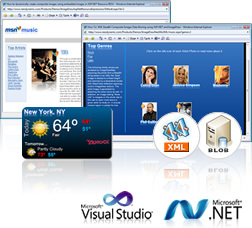 We are experts in those fields with strong know-how on .NET, ASP.NET, SSRS, PHP & Web projects. Designing & building dev tools since 2004!. Support & Assistance from Experts! Our products are used by many of the world's most important companies, government agencies, banks, and universities. Leverage your barcode, labeling and printing needs to Neodynamic's products like the following clients did!